Here in New York, the weather is getting warmer, which means it’s time to think of healthy frozen treats to cool down with! In addition to summer approaching, I was inspired to create some frozen recipes because I recently saw the movie “Frozen” and I am totally obsessed! I love everything about the movie and I can personally relate to Princess Anna’s character, so this movie particularly resonated with me. If you haven’t seen “Frozen”, you should, as it differs from most Disney movies and doesn’t really stick to the princess + prince charming = true love forever equation that’s typical of fairytales but I won’t give too much away in case you haven’t seen it. Getting back to my frozen treats, there’s nothing greater than indulging in a cold dessert on a hot summer day, but ice cream, frozen yogurt, and gelato can be high in calories and make you feel tired if you’ve had too much. Instead, today I made 2 different “ice creams” using a few very simple ingredients. The base for both of these recipes is just a few frozen bananas and almond or coconut milk. Both recipes are vegan, gluten-free, and won’t make you feel guilty or weighed down afterwards. 1.5 frozen bananas (freeze for at least 5 hours). Peel before freezing, and you may also want to cut into smaller pieces and place into a zip lock bag. Place cut frozen bananas in a blender, add ¼ cup almond milk, 1 tbsp. 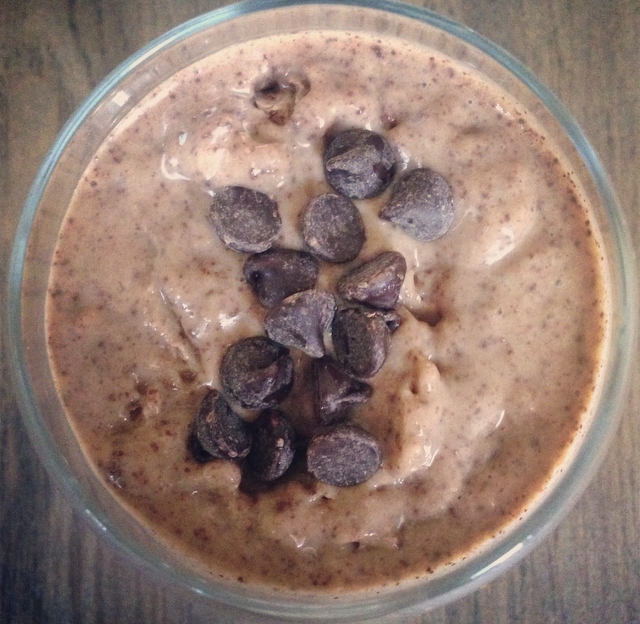 natural peanut butter, and chocolate chips, and blend on high. If the mixture becomes too liquid-y, simply place in the freezer for a few minutes, or you can freeze the entire mixture for about an hour in a non-stick container and then re-blend to create an ice cream texture. Serve in a glass or bowl and top with a few chocolate chips. Enjoy! 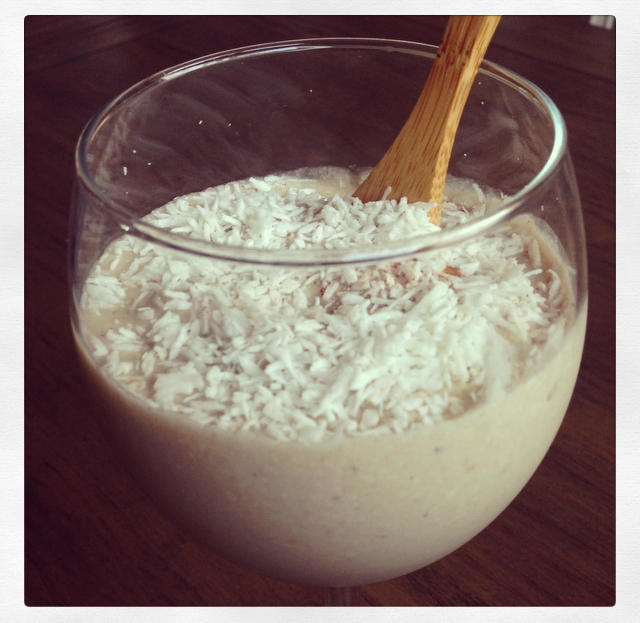 Place cut frozen bananas in a blender, add ¼ cup almond milk, a handful of raw cashews, 1 tsp. vanilla extract, and coconut flakes. Blend on high. If mixture is too liquid-y, use the same method as in the previous recipe, and either freeze for a few minutes, or freeze for an extended period of time in a nonstick bowl and re-blend to get an ice cream consistency. 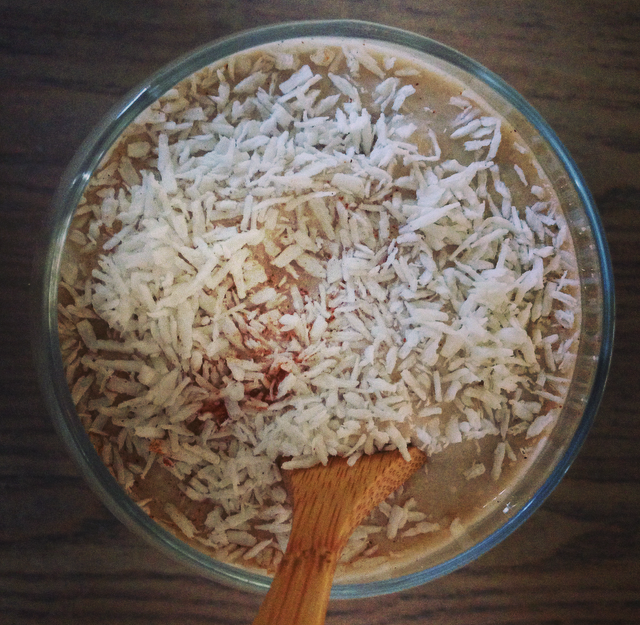 Serve in a glass or bowl and top with additional coconut flakes. Enjoy!